At the Hog Master Head Office the workers have been earning their pay by working nonstop and by working overtime. We have been extremely busy as customers have been rushing to get their hog roasting machines in before the end of the month. So there has been a surge in sales and deliveries, we have even had some customer arrive at the factory to pick up the hog roast machines themselves they are that eager or they are very passionate about their hog roasting machine. We have had one business owner buy three Hog Masters in on go. He was revamping his business and decided to get our shiny hog roasting machines in his restaurant kitchen. He also decided to buy Hog Roast kit, Spit Roast kit and BBQ kit along with the three Hog Masters. We have recently sold one to a guy in Malta called Ronaldo, we used our expert and efficiently courier service to transport our Hog Master across the seas. 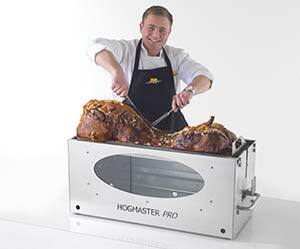 He is extremely pleased with the Hog Master and has loved it ever since it arrived. It has been a grand achievement branching out of the UK to various different countries customers in; Saudi Arabia have bought 4, France have we have sent 2, Spain have bought 3, Austria have only bought 1, Italy have been sent 2, Portugal have got 4, and we have also sent the Hog Master other countries like Australia, New Zealand, Columbia and many more. We a proud at Hog Master that the Hog Master hog roasting machine is travelling all over the world roasting for restaurants, catering companies and in the back gardens of people from different parts of the world. As well as seeing sales from all around the world we have seen so many sales here in the UK selling over a million each year. Helping people experience a hog roast making experience with ease or to help chefs create an exquisite dish, or to turn around the fate of a business that was looking to go bust and make them thriving and branch out across the UK. 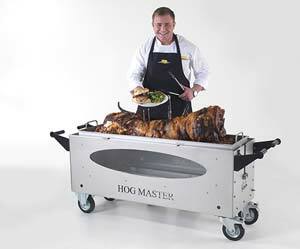 We have been making hog roast machines for many years now and can say the Hog Master is the best hog roast machine out there to date. Providing ease and perfect results when it comes to hog roasting, plus with many different accessories you can change the way you hog roast. How about a Hog Master?